You may have noticed I changed the banner. I was trying to relearn some Photoshop, but actually wound up using the www.pixlr.com, a free imaging software. We're not taking a vote on whether to keep this look or not. It's just a banner. I don't know if I want to really monkey with the thing a whole lot more. 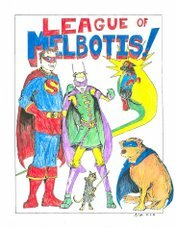 So expect to see Krypto up there (our patron saint of dogs and comics here at League of Melbotis) for quite a while. I considered having a Jimmy Olsen image up there, but, man... I wasn't sure Turtle Boy Jimmy or Elastic Lad was where we wanted to be every day for the next year if you visit the site. 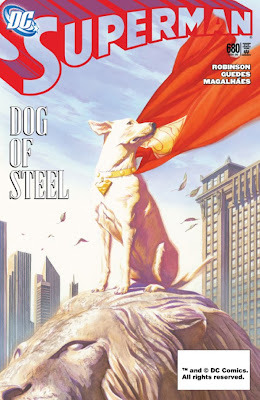 The Alex Ross painted image is of Superman's dog, , from the cover of Superman issue 680. Krypto was introduced way back in Adventure Comics #210 in 1955 as a pal for Superboy. He's still kicking around DC Comics and Superman comics (and in the newly relaunched Adventure Comics). 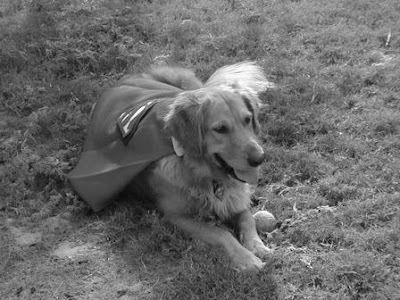 And if you want to know why Superman is my kind of superhero: He has a super dog, with no sense of irony. While, yeah, the idea of a super powered dog is silly and fun, there's a certain logic to Krypto (he's a Kryptonian test subject, like Laika). Sure, its kitschy and old school, but I like that DC is finding ways to keep Krypto around. And for us people who love our dogs and our comics, I tip my hat to Ross for a painting of Krypto the way I tend to think of the character in the context of today's Superman comics, as sort of the world's coolest dog. That said, I'm a fan of Amanda Conner's portrayal as lovable super-powered goof, too. Anyway, when there isn't room for Krypto in comics because somebody decided that Krypto wasn't "cool" enough or whatever, I'm not sure I'm going to want to read my Super-comics anymore. I've also long ago adopted Krypto as my IM and comment icon of choice, and I guess, being a bit brand conscious, I figured we might as well go-Krypto across the board. Heck, back in Arizona, I dropped $20 on a vanity plate that read "KRYPTO". No, its true. I'm not ashamed. In the end, Krypto is up there because Melbotis and I could always agree upon the necessity of Krypto in the Superman comics, and so, as a tribute to my pal, and his taste in the finer things, we're shaking things up a tiny bit. By the way, I've asked Scout, jeff and Lucy about who they would nominate. We're voting on the banner, right? I vote for it. By the way, that was still the shortest hiatus ever. I know. Stuff kept coming up.